For an unranked conference opponent playing the nation’s number one team a lot of things have to go just right for the underdog to pull off the upset. One by one, the pieces came together and North Carolina beat the Irish 78-73 Sunday afternoon in Chapel Hill. 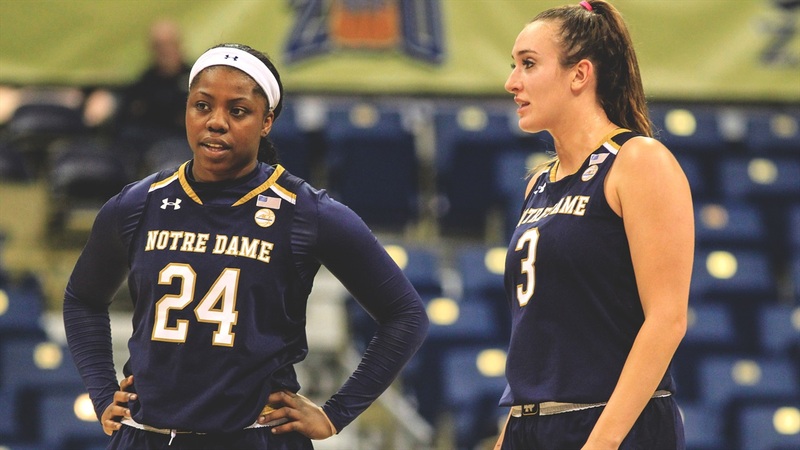 The first piece fell into place at Notre Dame’s Saturday morning practice when Jackie Young sprained an ankle and was forced to sit out the game against the Tar Heels. Then the other pieces started to line up just right for the Tar Heels throughout the game. The key piece was a fabulous effort from redshirt senior guard Paris Kea, who scored 30 points on 11 for 17 from the field including 5 for 8 from beyond the arc. Kea also had 10 assists and 3 steals. She was averaging 14.7 points per game but was no doubt confident coming off a 26 point effort in the Heels’ last game against Virginia Tech. "I thought Carolina played a great game, especially Kea," head coach Muffet McGraw said. "We had no answer for her. It was disappointing to see our defense collapse like that. We had some key turnovers late in the game and we haven't been in that situation enough and we need to practice it quite a bit more." Another crucial piece for the Tar Heels was a better than normal three-point shooting effort. UNC came into the game averaging 8.2 made threes per game on 33.3% shooting. They shot 27 three-pointers and hit 11 (40.7%) against ND. The Tar Heels defense registered 11 steals and forced a total of 20 Irish turnovers. Fifteen of the turnovers came in the second and third quarters and cost ND critical possessions. UNC’s prior opponents had averaged 15.9 turnovers a game. For an underdog, keeping the game tight until halftime is important — and UNC did just that trailing by two at the break. Then they were then able to ride confidence, hope, and the home crowd to a 28-17 third quarter advantage. The final piece of the upset puzzle was hounding the ACC’s leading scorer into a horrible shooting game — Arike Ogunbowale made just 5 of 21 shots (23.8%) from the field including 1 for 7 from three. She started slowly and never got going. Ogunbowale finished with just 13 points and couldn’t give the Irish the spark she so often has. Marina Mabrey led the Irish with 20. She made 4 of 6 threes and 7 of 11 overall. She had 5 rebounds, but her 4 assists were offset by 4 turnovers. Jess Shepard passed 2,000 career points early in the third quarter. She ended up with 19 points (8-13) from the field and had 8 rebounds and 4 assists, but she also had 4 turnovers — none more significant that an errant pass in the game’s final minute with ND down 3 points. Brianna Turner also scored 19 points (7-9 from the field) with 6 rebounds and 3 blocks. She was stripped of the ball a number of times and ended up with 7 turnovers. Together, Mabrey, Shepard and Turner made 22 of 33 shots (66.7%), and Shepard and Turner combined to go 8 for 9 from the free throw line. Regardless, their combined effort was not enough to overcome the absence of Young and the miserable shooting effort by Ogunbowale. The Irish turned the ball over 8 times in the second quarter and 7 times in the third quarter, as the Tar Heels roared from a two-point halftime deficit to lead by 9 (62 to 53) going into the final quarter. UNC scored 28 points in the quarter despite missing seven shots in a row at one point. They finished the quarter making 7 of their last 8 shots as Kea scored 16 of the team’s 28 points in the quarter. Because of the turnovers, the Irish only managed 10 shots while the Tar Heels had 20 attempts. Notre Dame went on a 12 - 1 run to take the lead 65 to 63 in the first five and half minutes of the final quarter. The Tar Heels then scored on its next three possessions while the Irish had another turnover and a missed shot by Ogunbowale resulting in a 69 to 65 UNC lead with 2:39 to go in the game. The Irish tied the score again at 71 on a Turner three-point play. The Heels hit another three followed by another Ogunbowale miss and a Kea layup to give UNC a five-point lead with just 40 seconds left. Ogunbowale missed 8 of 10 shots in the final quarter. North Carolina turned the 20 ND turnovers into 21 points, and they scored 18 fast break points to just 14 or the Irish. Notre Dame usually has a significant advantage in fast break points, but not in this game. For the game, the Irish shot 49.1% — but just 46.4% in the second half. ND made 5 of 14 three-point shots — Mabrey was 4 for 6. Ogunbowale went 1 for 7. The Tar Heels shot 44.6% from the field, but scored 33 points on 11 made threes. With the upset win, the Tar Heels season record improves to 12-9, 3-4 in the ACC. Notre Dame is now 19-2 on the season and 6-1 in the ACC. It’s just the fourth ACC regular-season loss for the Irish in six years — all on the road. Notre Dame stays on the road for one more game playing at Clemson this coming Thursday night.